King Abdul Aziz, founder of the Kingdom of Saudi Arabia. King Abdul Aziz bin Abdul Rahman Al Saud (known as Ibn Saud) was a tall, imposing figure, a natural leader of men. He knew instinctively how to judge men and, as his rule progressed, how best to exploit the natural resources of his country for the benefit of his people. His achievement, the unification of many warring tribes all proud of their own lineage and traditions, laid the foundations for the modern state of Saudi Arabia. His success derived from his faith in Islam and his determination to maintain and build on the traditions of the region. It is the unique combination of faith and respect for tradition, while adapting to the technological developments of modern world, which characterizes the Kingdom of Saudi Arabia today. 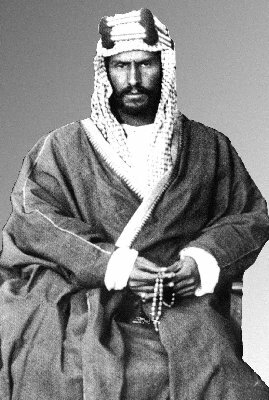 Abdul Aziz bin Abdul Rahman Al Saud (Ibn Saud) was born in Riyadh in 1880. He was born into the Al Saud family which, in the previous century, had consolidated its authority across much of the Arabian peninsula but, at the time of Ibn Saud’s birth, had seen its power greatly diminished. Indeed, in 1890, under threat from the Al Rashid (a powerful family in the Arabian peninsula and implacable enemy of the Al Saud), Ibn Saud went with his family into exile to Kuwait where he spent his early years. In Kuwait, as Ibn Saud grew to manhood, his thoughts were focused on reclaiming his family’s domains, now occupied by the Al Rashid. He had spent long enough in exile. He judged that if, with God’s help, he could take Riyadh, the people of Nejd would support the Al Saud and help him to oust the Rashid. When he was twenty-one, Abdul Aziz (Ibn Saud) decided to move on Riyadh. The difficulties of taking Riyadh with so small a force were obvious and intimidating. Abdul Aziz asked for volunteers to accompany him in the execution of a plan which seemed to have only its boldness to recommend it. With forty of his devoted friends, he left Kuwait in December 1901 (1318/19 AH) and reached Riyadh in January. The account of Abdul Aziz (Ibn Saud)’s assault on the Masmak fort and his retaking of Riyadh from the Rashid is perhaps the most dramatic of all the stories of modern Arabia. In its daring and determination, it was a sure indication of the true character of the man who was to found the Kingdom of Saudi Arabia. Under cover of night, together with his cousin (Abdullah bin Jelawi) and several other volunteers, Abdul Aziz stealthily made his way to a part of the city wall which he knew they could easily scale, with the help of grappling irons, unobserved. The wall he chose was adjacent to the house of a man who had served Abdul Rahman, Abdul Aziz’ father, some years before when the Al Saud had still ruled in Riyadh. When the wife of this man realized that the son of Abdul Rahman had come to reclaim his birthright, she vouchsafed some useful information about Ajlan, the Amir of Riyadh, the man Abdul Aziz would have to oust. Once within the walls of Riyadh, and with the benefit of this woman’s information, the small group quietly made its way to an empty house close to Ajlan’s residence. They entered the empty house, climbed to the roof and, by leaping from one roof to the next, they reached Amir’s residence. There they waited. At dawn, after prayers, Ajlan emerged from the Mosque into the street. With his quarry in the open, Abdul Aziz (Ibn Saud) gave vent to a loud battle cry and sallied forth from Ajlan’s residence to attack. Ajlan fled, with Abdul Aziz and his companions in hot pursuit. Quickly cornered, the Amir defended himself briefly until the sword of Abdullah bin Jelawi cut him down. The garrison of Riyadh was utterly demoralized by the unexpected attack and the death of their leader. Assuming that such an assault could have been mounted only by a large and well-equipped force, and perceiving that the population of the city welcomed the return of the Al Saud, they surrendered without further resistance. brothers and sisters, deprived of our birthright. for pleasure, not nurtured in honor, will wither. that I must return to the place of my birth. but it was the desert had given me breath. the first taste of rain can emerge from the earth. “Who will ride at my side on this perilous venture? Sixty answered my call, young and brave, one and all. we held faith as our shield and justice our sword. but in all I deferred to the will of the Lord. putting trust in the God who created the world. that folly could lead us to try to take Riyadh. without hesitation they answered my call. we gathered in silence beneath Riyadh’s wall. to know he has reached for the best he can be. we would know we had fought for a cause that was right. each one read the risks from the look in my eyes. we watched for the sun to put light in the skies. must depend in the end on our use of surprise. a man or an army, the battle is won. such odds left no question what had to be done. The fate of the Amir of Riyadh was sealed. He must die for the wounds of Al Saud to be healed. we struck as the lion descends on its prey. the rest of our brothers then joined in the fray. Al Saud had returned to its home on that day. was merely one step on a path, hard and long. in the land where the message of God was revealed. Abdul Aziz (Ibn Saud)’s drive for consolidation was successful to the extent that by the end of 1904 (1322 AH), he had managed to break the stranglehold of the Rashid and push them into the area at Jabal Shammar in northern Nejd. The Rashid, desperately, appealed to the Turks who sent them reinforcements. Nevertheless, Ibn Saud’s desert fighters kept control of the situation in Nejd. Through diplomatic negotiations at one time, and guerrilla warfare at another, Abdul Aziz forced the Ottoman Empire to recall its troops from Nejd. Thus on the death of Al Rashid in 1906 (1324 AH), Ibn Saud enjoyed complete control over Nejd. Having accomplished this objective, he turned his attention to Al-Hasa and the area of the Arabian Gulf which was still under Turkish rule. Calculating on the Ottoman Empire’s preoccupation with uprisings in Europe, and on his belief that Britain, considering the situation a domestic affair, would remain neutral, Ibn Saud launched a successful assault, and by 1913 (1331/32 AH), he had consolidated his authority in both Nejd and Al-Hasa. In 1916 (1334/35 AH), Abdul Aziz (Ibn Saud) concluded another treaty with Britain which recognized him as the sole ruler of Nejd and Al-Hasa. This agreement gave Abdul Aziz the tacit right to oust the remaining members of the Rashid family. He did so, and by 1918 (1336/37 AH) his authority was extended to reach the outskirts of Hail, the capital of the Rashid. During the next year clashes occurred between the forces of Sharif Hussein of Makkah and a force of the Ikhwan. Nevertheless, Abdul Aziz withheld his troops from attacking the Hijaz. In 1920 (1338/39 AH), he moved further south and consolidated his authority in Asir. The following year, he completed his campaign against the Rashid in Hail which fell under his control. Restraining himself time and time again from proceeding to Hijaz, Abdul Aziz adopted a policy of sitting and waiting. This final consolidation of the Arabian Kingdom was accomplished by the end of 1925 (1345/46 AH). In the previous three years, the Sharif of Makkah had failed to maintain good relations with the British and, through his incompetence in administering the Holy Cities, had alienated much of the Arab world. Abdul Aziz ( Ibn Saud), responding to a popular demand from the people of Makkah, became the King of Hijaz and the Sultan of Nejd and its Dependencies. Ibn Saud was now ruler of most of the Arabian peninsula and Guardian of the Holy Cities of Makkah and Madinah. The formal foundation of the Kingdom of Saudi Arabia took place on 23rd September, 1932, when a majority of the world powers recognized the sovereignty of the new nation. In the course of his long reign, King Abdul Aziz (Ibn Saud) devoted much time and energy to the development of international relations. In the same year, King Abdul Aziz met the British Prime Minister, Winston Churchill. 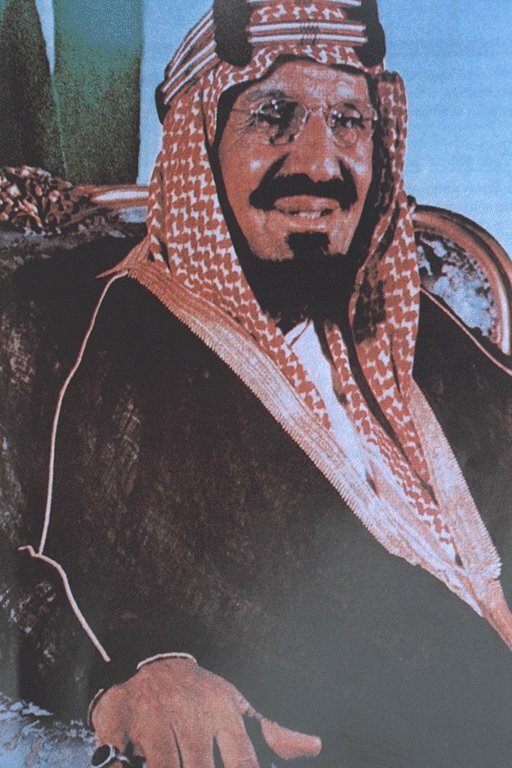 The economic and technical co-operation which exploitation of the Kingdom’s oil demanded, combined with a community of interest in many areas, ensured that the friendship between the Kingdom of Saudi Arabia and the United States of America, initiated by King Abdul Aziz, was to grow in succeeding decades. The Saudi National Day is 23rd September. For Saudis and, indeed, for others in the region, the Saudi National Day celebrates one of the most important events of the 20th century, the founding of the Kingdom of Saudi Arabia. As the Minister of Culture and Information, H.E. Dr Fouad Al Farsy, has said “it marks the start of the greatest political and social changes the region has ever witnessed”.